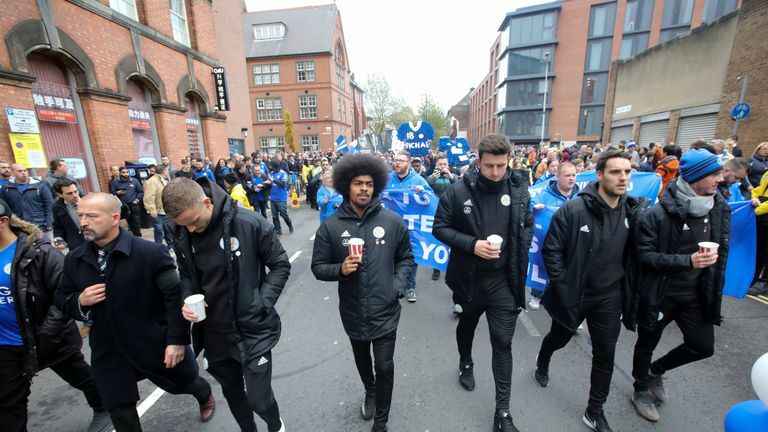 Leicester City's Harry Maguire and James Maddison led Saturday's fan memorial march in honour of club owner Vichai Srivaddhanaprabha. The injured duo were able to join supporters on their march from Jubilee Square to the King Power Stadium because they are unavailable for Saturday's match against Burnley. Andy King and Hamza Choudhury also attended. Leicester supporters have named it the '5000-1 walk' after the club overcame those odds to win the Premier League in 2016. Saturday's Premier League game was Leicester's first home fixture since the helicopter crash outside the King Power Stadium which killed the chairman along with four others on October 27. Fans and supporters from neighbouring areas also took part in the walk as well as traveling Burnley fans who arrived early to join. One Leicester fan told Sky Sports News: "It's a terrible day, but awesome. It shows what football can do. There's Burnley fans here two hours early just to come and walk." Another Foxes supporter said: "It's plucking at the heart-strings, the guy did so much for us. We were nothing before he came, we were struggling. He came in, put his money in and he never stopped smiling - he always had a smile on his face." Before the game, a two-minute silence was observed in memory of the men and women that have lost their lives in action and the five who died in the crash. A video was also shown in memory of the owner. Fans were given commemorative scarves, pin badges, clappers and programmes in honour of Srivaddhanaprabha. Leicester announced on Friday their plans to build a statue of the chairman outside the King Power Stadium.